Louvered vent inserts for Ford Transit full sized vans. (150, 250, 350) Fits low medium and high roof models. Black powder coated finish over aluminum. Quality "Made in Germany" product. Easily installs over window. Roll down window, place Airvent in window track and roll up window. Netting behind louvers keeps out insects. Very secure. Can't be removed from the outside. 2 piece set - both driver and passenger Airvents are included. Does not fit Transit Connect models. Haven't had a chance to actually use these yet as it's too cold to 'inhale' any cold air. I've fitted them in the windows and they are very high quality, powder coat really adds to the durability and they fit the windows perfectly. I'm headed to warm weather and I'm looking forward to using them. 2015 Ford transit: With an installed MaxxFax as far aft as the van will allow, the need for an incoming air source is critical! 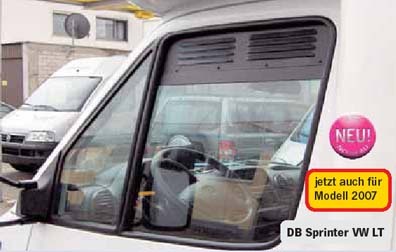 I saw these Cab Air Vents on the Ford Transit Forum. I had to get on the waiting list because they sell so quickly evidently. After a couple months, I got an email notifying me that the parts were available. Ordering was easy, and they shipped within a couple days. We've used them twice since while camping. They are truly an invaluable thing to have if you are camping or living in your campervan! With our roof fan going, you can feel the inrush of air from the vents up front. Because of this we were comfortable inside the van the entire time. There was no visible moisture inside the van in the morning because the vehicle was ventilated. The workmanship and design are outstanding. The screen backing keeps out any bugs or mosquitos. Great product! Very pleased with this crucial purchase! We spend a lot of time in our rv conversion Ford Transit these are awesome to get the air flow thru the van without the bugs. They are also very secure so people cannot break in like when you have the windows open. These are a must have for anyone with this type of vehicle. Perfect.... Exactly what I needed to vent... Nice fit. Great idea...! I am very satisfied! Good quality and fit for my winnebago Paseo.